Carbon Monoxide in office buildings is another common cause of CO poisoning. It has many similarities to other mass poisonings where people are awake during the time of exposure. These poisonings often fall into the category of chronic carbon monoxide poisonings because they are often not discovered as most office buildings are not mandated to have carbon monoxide alarms. Even when there are alarms, the alarms may not go off because the levels of carbon monoxide in office buildings often don’t exceed the alarming levels of most detectors, for consistently long enough periods to set off the alarm. 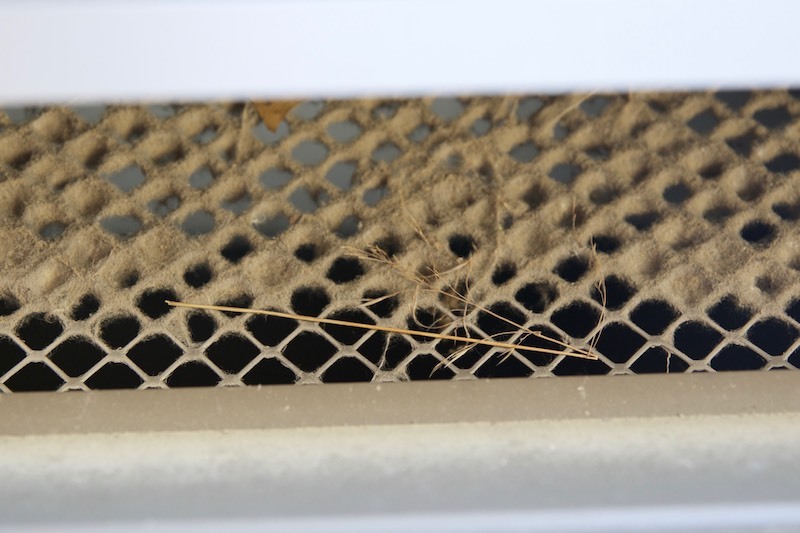 Shown above is cottonwood debris on a fresh air intake. Failure to maintain fresh air intakes can cause the formation of carbon monoxide in office buildings. The core problem with alarms is that they may reset when the carbon monoxide levels in office buildings wax and wane. Most HVAC systems in office buildings cycle on and off repeatedly every hour. It is therefore possible that the levels may spike at highly toxic levels, drop down below 50 ppm and then escalate again. While this is below the standards for alarming, it can still result in carboxyhemoglobin levels reaching harmful levels. For more on long term poisoning without an acute hospitilization, click here. The source of carbon monoxide in office buildings is similar to what might be found in schools and hotels: Chief culprit furnaces and hot water heaters. If the poisoning is occurring in the winter in colder areas, the furnace is likely the culprit. When the poisoning occurs in the warmer months, then it is likely the hot water heater. The different niche that often occurs with office buildings is that they are often smaller buildings than schools and hotels. They may be using HVAC equipment closer in size to what one might find in homes. In intermediate sized office buildings, rather than moving to much larger boiler type systems, the solution is to add multiple smaller units. When tested one unit at a time, the units work fine. But when more than one unit is operating simultaneously (a condition which is rarely tested) there may be inadequate oxygen for the for the fuel to burn cleanly, resulting in the formation of carbon monoxide. For more on the need for adequate combustion air, click here. Again, it is the intermediate sized buildings that often fall short in maintaining the HVAC systems. While hotels and schools will typically have full time maintenance staff, the intermediate office building often relies on quarterly maintenance and inspections, without day to day care. Even if the initial design of the building is such that there is adequate fresh air (combustion air) for the fuel burning appliances to burn cleanly, over time, these fresh air intakes can be clogged. Seasonal accumulations of things such as leaves and cottonwood debris, can seriously interfere with fresh air venting. See above picture.